I was surprised to read in Science Digest that the increase in the urban land from 2000 to 2030 could be as much as 590,000 square miles (1.53 million square kilometers), which Science Digest went on to say would house an increase in the urban population of 1.47 billion people. The shock was because the researchers are suggesting that the substantial urbanization that will occur over the first three decades of this century will be at American urban densities, 2500 per square kilometer or 1000 per square mile. Urbanizing on 1 to 3 Acre Lots? But that was just the beginning. The econometric research, A Meta-Analysis of Global Urban Land Expansion by Karen C. Seto, Michail Fragkias, Burak Güneralp, and Michael K. Reilly, partially funded by the National Science Foundation, indicates that the increase in urban land area between 2000 and 2030 could be as much as 4,900,000 square miles, or 12,600,000 square kilometers. This is more than the area of Australia, Argentina and Mexico combined. It does, however, seem unlikely that developers and home builders will provide for the expanding urbanization in China, India, Indonesia, the Congo, South Sudan and Bangladesh with ranch houses on one to three acre lots. The 4.9 million square mile or 12.6 million square kilometer urban land increase figure is based upon the GRUMP database, which we reviewed a year ago. GRUMP found the world to have more than 1.3 million square miles of urban development or 3.5 million square kilometers. The GRUMP database is purported to use United States Census Bureau criteria for designating urban land, yet counts three times as much land in the United States as being developed as the Census Bureau. 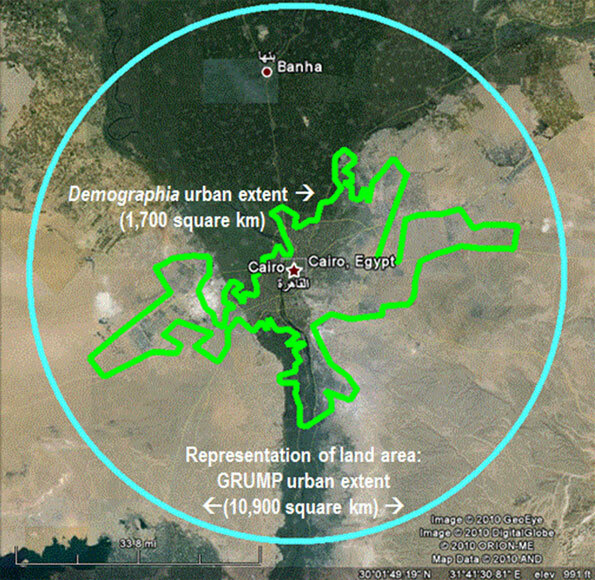 We also showed that the GRUMP urban area for Cairo was at least six times the actual urbanization based upon examination of Google Earth maps (Figure 1: map). At 4.9 million square miles or 12.6 million square kilometers the average new urbanization would be under 500 per square mile or 200 per square kilometer. These densities fall well short of the urban density thresholds of 1000 per square mile or 400 per square kilometer that are used by census authorities in Canada, France, the United Kingdom and the United States. These nations and others consider densities this low to be rural rather than urban. Indeed, parts of rural China have higher densities than the GRUMP density estimates. 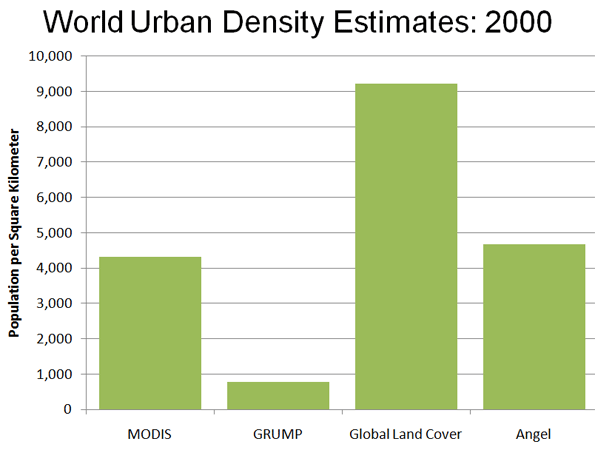 Estimating Gross World Urban Area: Other estimates of world urbanization are more modest than the GRUMP estimate, which indicated an urban land area of 3,532,000 in 2000. The US Geological Survey MODIS mapping system estimated world urban land area at 650,000 square kilometers in 2000. In A Planet of Cities, Shlomo Angel, Jason Parent, Daniel Civco, Alexander Blei, and David Potere (Angel) use USGS MODIS mapping and further modeling to estimate the 2000 world urban land area at 605,000 square kilometers. Another source, the European Union's Global Land Cover system put the number at 308,000. The wide variation in estimates indicates the complexity of the task of estimating the world's urban land area. The estimates can be evaluated by comparing their implied population densities. The EU Global Land Cover estimate would have required an average urban population density of more than 9,000 per square kilometer (23,800 per square mile) in 2000, based upon the 2000 United Nations estimate of urban population. This is nearly as dense as the city of New York (not the urban area) and a quarter more dense than Singapore. Anyone who has traveled to urban areas around the world, large and small, would quickly observe that average densities approach neither New York City nor Singapore. The Global Land Cover estimate thus appears to be too low. The GRUMP world land area estimate would mean that the average urban population was 800 per square kilometer in 2000 (2,000 per square mile). This would place the world urban population density at least 15 percent below that of the United States (900 per square kilometer or 2,400 per square mile) or Canada in 2001 (1,000 per square kilometer or 2,500 per square mile). As every urban planner knows, the United States has the least dense urban areas of any major nation. GRUMP thus appears to substantially over-estimate the amount of urban land. The MODIS and Angel estimates are similar. The MODIS estimate would require an average world urban density of 4,300 per square kilometer (11,100 per square mile), while the Angel estimate would indicate a world urban density of 4,700 per square kilometer (12,200 per square mile). These two estimates would appear the most accurate, because they are well above the US and Canadian densities and any visitor to Manila, Shanghai, Cairo or a myriad of other urban areas in the developing world cannot help but note the much higher densities. At the same time the MODIS and Angel are well below the EU Global Land Cover estimates, which appear to be very high (Figure 2). The MODIS and Angel estimates would indicate that approximately 0.5 percent of the world's land area is urbanized. Demographia World Urban Areas also provides population, land area and urban density estimates, though its detailed data is limited to approximately the approximately 800 urban areas with more than 500,000 population. Applying the Angel, et al urban area size density ratios and projections for urban expansion to 2010 (Angel middle scenario), the Demographia world density estimate would be approximately 20 percent lower, while the urban land area would be 25 percent higher). Demographia World Urban Areas bases its estimates on national census bureau data for urban areas (Note) where it is available and for others estimates urban land area from Google Earth (these are the overwhelming majority of cases), using urban perimeters. More than 50 percent of the difference between the Demographia and Angel estimates results from the use of Census Bureau urbanization data in the United States. Believable and Unbelievable Projections: Angel also provides projections for the increase in urban land area. Between 2000 and 2030 Angel projects that new urbanization could be from a middle case of 700,000 square kilometers (270,000 square miles) to a high estimate of 1,160,000 square kilometers (445,000 square miles), with a low case of 360,000 square kilometers (140,000 square kilometers). These are believable figures that are only a small fraction of the high-end 12,600,000 square kilometer (4,900,000 million square miles) projections by Seto, et al. The circumstances that might lead to urbanization equaling the land area of Australia, Argentina and Mexico are not believable. A sufficient reasonableness test does not appear to have been conducted. Note: Most of the world's national census authorities provide geographical data for only legal jurisdictions, such as states, provinces, regions, counties, etc. In some nations, urban area is developed to indicate the population and land area of continuous urbanization. This occurs in the United States, Canada, the United Kingdom, France, Sweden, Denmark and other nations. Photo: Developing world urbanization trend to 2030 according to high-end proectiong based upon GRUMP. 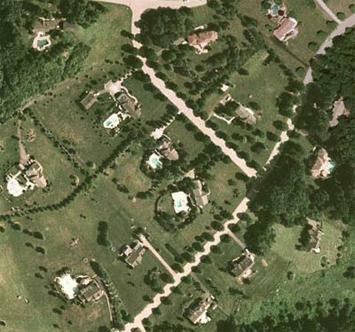 Houses on two acre lots in Morris County, New Jersey (suburban New York). From Google Earth Pro. Submitted by Andrew Kirby on Sat, 09/10/2011 - 11:52. In my experience, many working in the urban field have something less than a 'love-hate' relation with their subject [http://www.currentresearchoncities.com/2011/05/do-we-need-to-hate-cities-to-be.html]. Many social scientists and those in the humanities have internalized a dystopian worldview from Mike Davis, while many urban ecologists start off with the assumption that urban growth is anti-nature and inherently a 'bad thing'. So the choice of a low-density metric to make a point about the dangers of urban/population growth is predictable. Shlomo Angel's work, on the other hand, is much more pragmatic, less ideological and consequently more valuable.